Should we get excited about the e-petition site? 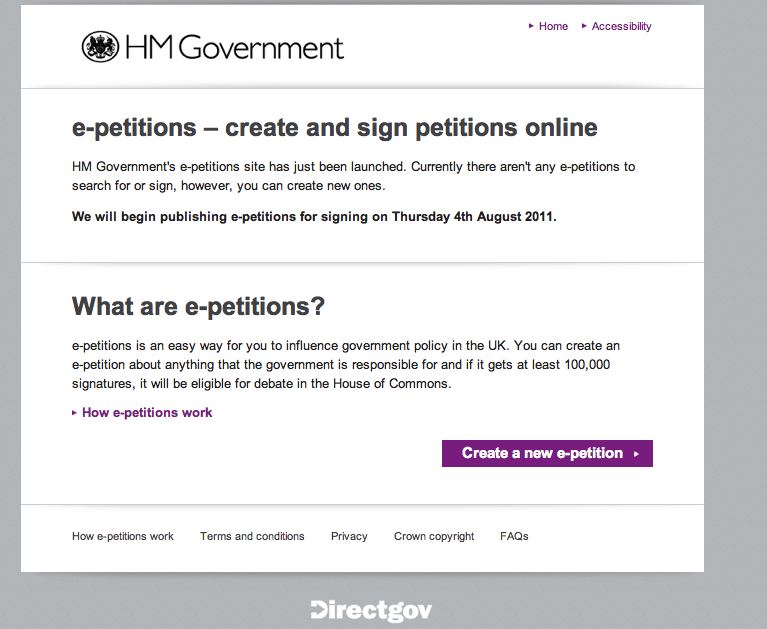 Thursday will see the first petitions go live on the Governments new e-petition website (http://epetitions.direct.gov.uk/index.html) which is designed to replace the No10 Petition site that was closed after the last election. On the new site any petition that gets over 100,000 names on it ‘could’ be debated in Parliament. I’ve written a separate post here about how to set up a petition. Undoubtedly it’ll get some coverage in the coming days as the first few petitions go live and reach the target, blogger Guido Fawkes has already launched a campaign for a vote on reintroducing capital punishment and I’m sure he’ll be the first to get over 100,000 names. Overall the 100,000 target seems appropriate, although only 8 petition on the old No10 site achieved this. My work on campaign totals suggest that no campaigns in the last 12 months managed to achieve that target, but the numbers that campaign groups like 38 Degrees have been mobilising recently shows that its possible for any organisation that put effort into achieving it. After over a year of waiting for the new e-petition it appears that we’ve lost a certain amount of transparency. The old system allowed you to view a list of those who’d signed up and also saw that most petitions that generated a significant number of actions got a response from the relevant department, something that at present it doesn’t look like this will happen with the new site. The main gain is the opportunity to have the issue debated in Parliament if you reach the 100,000 target, but for me that seems to be about it. 1. Too Long – Campaigning is increasingly about agility so indicating that petitions will take 7 days to be approved by government departments is going to slow things down and make it hard for organisations to capitalise on public concern about an issue that is in the media. 2. Engaging citizens – It’s a shame that the overhaul of the system hasn’t allowed for more thought to be put in about different ways that individuals could sign the petition. The European Union announced a similar (albeit more bureaucratic) process earlier this year, which allowed citizens to submit their names in a number of different formats rather than requiring everyone to get to a computer (and have an email address). 3. Preventing abuse – The eDemocracy blog suggests that it’s not been possible to provide a system to verify that those signing are from the UK or avoid people add multiple signatures. I accept that this would add another layer of complexity (and cost) but if this is a serious attempt to open up the political debate should more thought been put into this? 4. Control – I’m concerned about the fact that you can opt-in to get a response to the government, but not provision is being made to those who set up the petition to contact those who have signed. I’m not clear what most campaigning organisations have to gain from using a system like this. 5. Scale – While 100,000 is probably the right number for a nationwide petition, it seems a shame an option hasn’t been made for petitions on local issues or concern where getting the current target might be impossible. For example, it’d be nice to have seen the option for 25,000 signatures from a county/constituency on a local issue to lead to debate. 6. Outcome – Say you’ve done all the hard work and got 100,000 people to sign the petition, what do you get from it? A debate in Parliament, it’s not clear if the debate will lead to a vote, or simply a debate similar to the format of a Westminster Hall debate, where a minister is required to respond. If it’s the latter then is a strategy of engaging interested MPs more effective, while those organisations looking to introduce new legislation would do as well to engage MPs who do well in the Private Members Bill ballot. Will you be making use of the e-petition site? Is it a helpful contribution to campaigning? Head of Mobilisation at Save the Children, was Head of Campaigns at Bond, co-founder Campaign Bootcamp, blog about campaigning because I'm passionate about seeing more campaigns win, election geek (and former Labour Party activist), interested in monitoring and evaluation, blog is all my own views. Prone to bad spelling! Is #RevokeArticle50 the biggest petition in UK history? How should you prepare for a ‘snap’ General Election?